With Microsoft constantly promoting the Windows 10 operating system for Windows, the company seems to be working on a high-end smartphone. 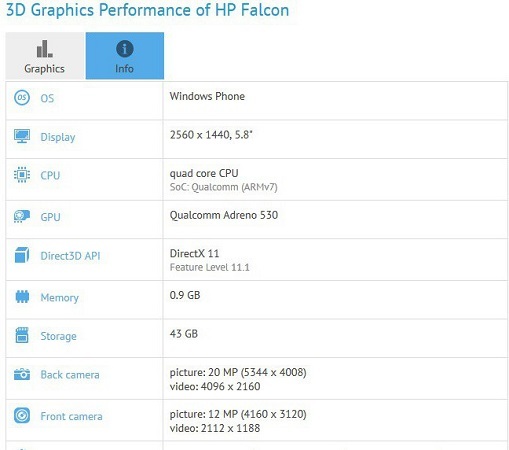 A mysterious smartphone named ‘HP Falcon’ was spotted at benchmarks. Interestingly, the handset is expected to be a Windows Phone device running the latest Windows 10 OS. The listing reveals that the handset is powered by the latest Qualcomm Snapdragon 820 processor along with the Adreno 530 GPU. The test unit had just 0.9 GB of RAM but should have at least 2 GB when released. The HP Falcon Windows Phone device is said to sport a 5.8 inch with super high resolution of 2560 x 1440 pixels. The handsets are said to have a 20 MP primary camera along with a 12 MP front facing camera. The device is expected to launch in early 2016. We should be hearing more details soon.